What makes Paver Solutions different from other paver installers? First, Paver Solutions is a division of Erickson Construction, a commercial general contracting company established in 1982. The benefit of having your paver project installed by a general contractor is that all aspects of your project can and will be handled by our company. Second, Paver Solutions is an ICPI (interlocking concrete paver institute) certified installer. ICPI is the only specific standard of paver installation in the country. 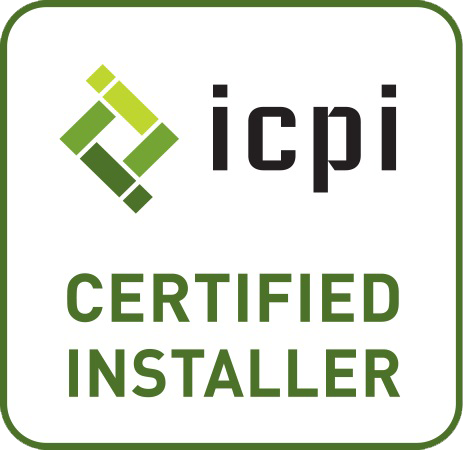 This certification means the installer has been trained on the proper installation procedures, ensuring a quality installation. Paver Solutions will follow all ICPI guidelines on your installation. Lastly, Paver Solutions is financially stable and will be there to warrant our work. Paver Solutions will be here today and tomorrow. The peace of mind of dealing with a legitimate company is apparent when you visit our beautiful showroom. For a driveway application, the existing driveway is removed and graded to the proper depth. Crushed concrete base is installed at a depth of 4-6”. The base is compacted to proper density. A layer of bedding sand is installed at a nominal thickness of 3/4″ to 1″ and screeded level. The pavers are installed in the selected pattern and bordered. A poured concrete edge restraint is installed to retain the pavers from shifting. Joint sand is spread over the top of the pavers and vibratory compacted into the paver joints. It is then swept clean and all concrete debris is removed from the site. Once your order is paced, the job will typically be ready for installation within a couple of weeks. However, the time frame can vary depending on the selected products. Once the materials are on site most installations are completed within 1-2 days. Should I use thick or thin pavers? The thickness of pavers is determined by the use of the paver and the underlayment. 30mm pavers “thins” are used for pedestrian traffic only and are only installed on a concrete foundation. 60mm pavers “thicks” are used for vehicular traffic or when a concrete foundation is not present. Thin pavers should NEVER be used on driveways. Will weeds grow up through the pavers? When pavers are properly installed, over 4-6” of compacted base, it’s very difficult for anything to grow up through the pavers. When weeds are present in a paver driveway it is usually caused by an incorrect installation lacking the proper amount of base or compaction. In rare occasions seeds that settle into cracks can germinate but they are very easily removed and usually go away at next wind or rain storm. Should the pavers be sealed? The pavers will have a better overall appearance. The sealer helps with stain resistance. Sealer will help stabilize the joint sand. Though it is not a requirement, we suggest sealing pavers on all jobs to keep your pavers looking their best. Our standard warranty is (1) year non pro-rated covering the installation and workmanship. The pavers themselves are covered by each manufacturer and most warrant their material from twenty years to lifetime but only if the pavers are installed correctly to ICPI guidelines. You may pay with cash, check or credit card. We accept Visa, MasterCard and American Express. How do I make a paver selection? Your salesman can show you paver sample boards, however, we strongly suggest that you visit our showroom to see the product first hand. If you choose a paver color from the internet, TV, brochure or just a small sample board it will more than likely not look the same when you see the actual product. It is impossible to see everything that is available out of the back of a truck that’s why we built a showroom with over 3000 square feet of colors, shapes and patterns to choose from. We provide pavers from Flagstone, Tremron, Old Castle, Belgard, Stabil, Tri-Circle and more. We also offer natural stone, clay and other man-made selections. Please come visit our showroom today to view the many styles, colors and shapes available and let our design team lend a hand picking out the perfect combination for your project. Do you have a question? You can submit one below or you can visit our Facebook or Google+ page. What a transformation! We are very pleased with our new driveway. It has changed the look of the front of our house. Mark made excellent recommendations on color, size and design. The crew was very professional, efficient, quick, kind, and accomodating. Your customer service is great. Two months later, we are still getting compliments from our neighbors. Our 5 boys love the extra space to ride and play! Thanks for a job well done.